Melting Technology has studied a new way to recover aluminum from furnaces dross: the PE Dross Cooler. Due to thermiting, the cooling time may take many hours to cool below 400°C, the temperature at which thermiting ceases. Various cooling methods are in existence: vibrating table, rotary drum cooler, dross press and last, but not least, the PE Dross Cooler. This method is the most efficient, safest and environmentally sound of all the cooling methods. The recovery of aluminum with PE Dross Cooler is always higher than with other methods: this can be explained by the fact that thermiting is stopped as soon as the inert gas is applied. 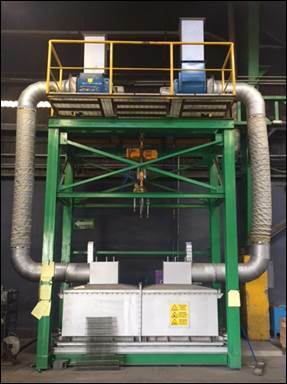 This new equipment can process up to 1200 kg of dross (black and non-reactive or white and reactive) and should be placed nearby the furnaces to minimize the oxidation time before cooling.